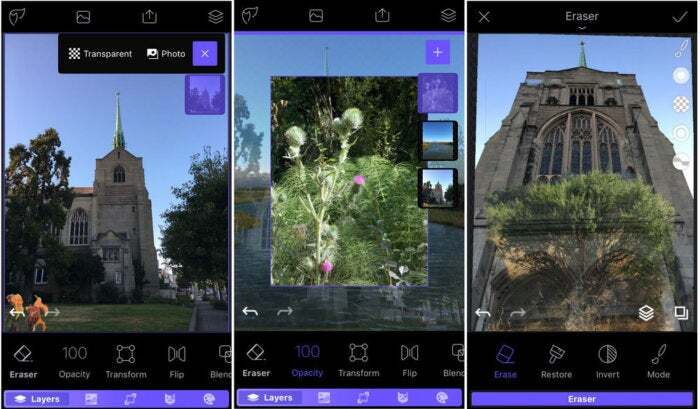 Lightricks’ Enlight Photofox is a major update to the Enlight iOS app, a Photoshop-style mobile photo shooting and editing app that delivers a vast variety of corrections and special effects tools and workflows. Photofox includes sophisticated painterly and collage capabilities designed to transform your images into works of art. Technically, Photofox is an update of the original Enlight app, but it looks and feels more like a related standalone app targeting a pro level audience. It’s similar to its predecessor and is available alongside it on the App Store. 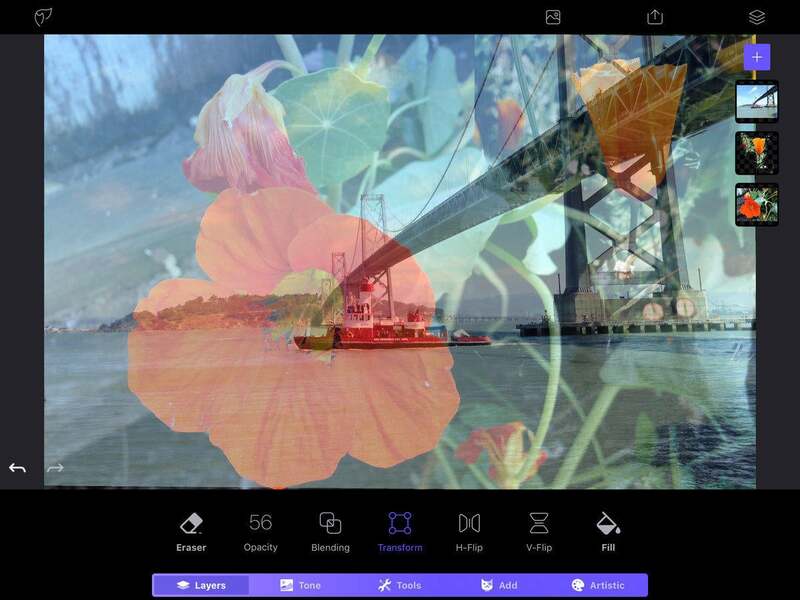 Photofox is primarily a photo editing tool, but it kicks the software’s capabilities up a notch, emphasizing creative compositing with a new focus on layering, blending images, and special effects. Photofox Pro lets you combine up to five layers. 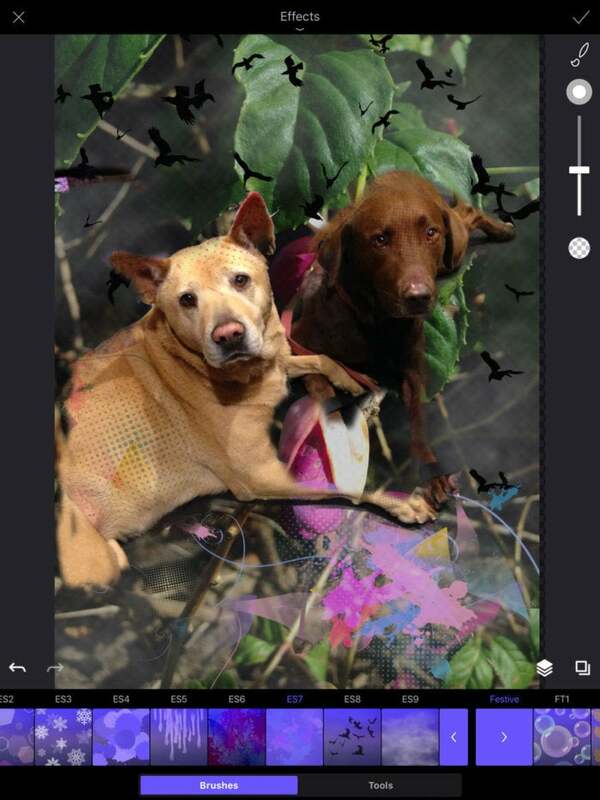 Unlike the original app, Photofox works with raw files and allows multiple layers instead of just two. 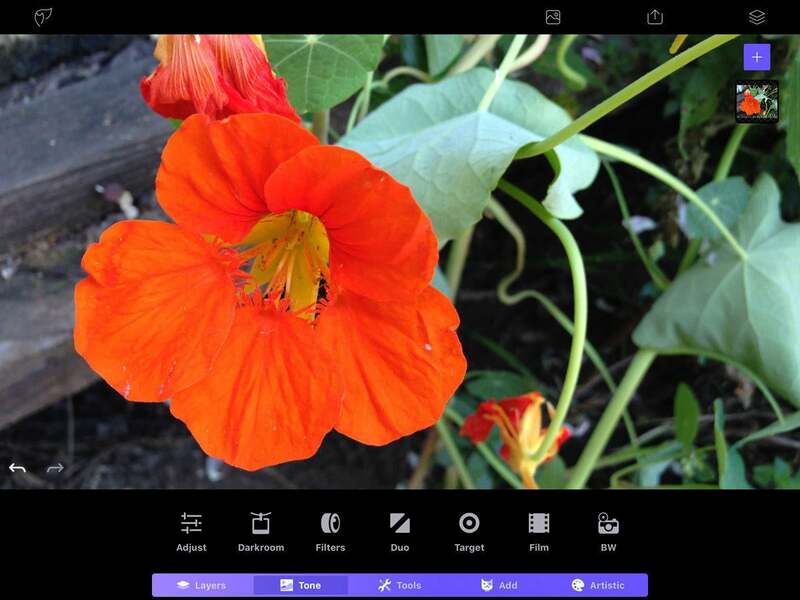 An interface overhaul keeps the app fairly simple, but using Photofox to its best advantage requires a more imaginative vision of composited images coupled with a sleight of hand. The less-cramped iPad version is slightly easier to use, because in addition to the extra screen space, you can use the app in landscape mode, while Photofox’s iPhone app only operates in portrait orientation. Photofox’s new Layers feature (similar to the Mix feature in Enlight) lets you combine, blend, and merge up to five layers in a single composition, where you can precisely edit individual layers as you build your picture. 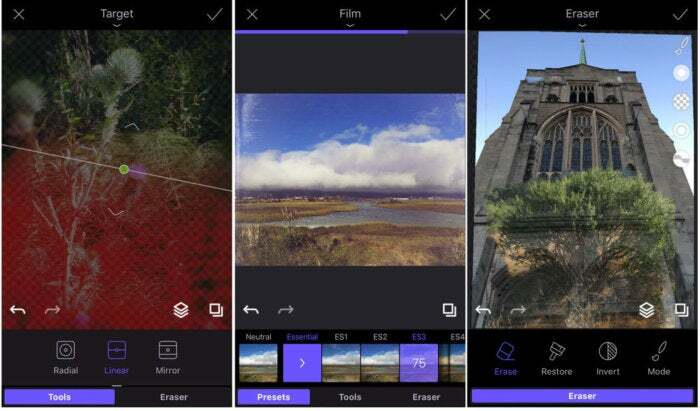 The eraser trims unwanted parts of the photo as you adjust opacity and exposure, and add filters, frames, stickers, and other elements, to naturally blend the montage. The Layers Blending feature offers numerous presets. The edge avoidance feature is especially helpful for such compositing, while multiple undos save your photo when you go too far. With the free version, you can mix two layers, but to use all five possible layers, you’ll need to subscribe to the app’s paid Pro version. Special effects presets and adjustable brushes make each image unique. A new Darkroom feature—also available only with the paid Pro version—gives you granular control over tone, contrast, and detail. It’s nicely done and well organized. 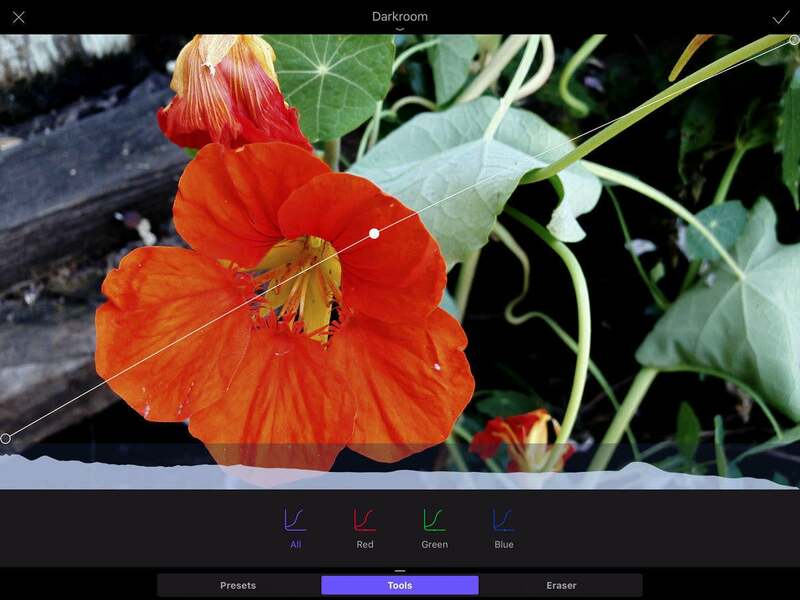 With its vast quantity of tools and controls, Darkroom is almost an app within an app, providing multiple sets of filter looks and photo tools like Basic, Details, Color, Split Tone, and Curves. Each category reveals its own context sensitive controls with a tiny swipe of the finger. Multiple filter packs can enhance or alter the mood of your photos. Photofox is packed with fonts, graphics, and presets to offer artistic control over your images. Light FX, a new feature for this version, offers an assortment of blendable light flares and leaks. Just choose one and use your finger to adjust its size, position, and opacity to create an otherworldly aura. 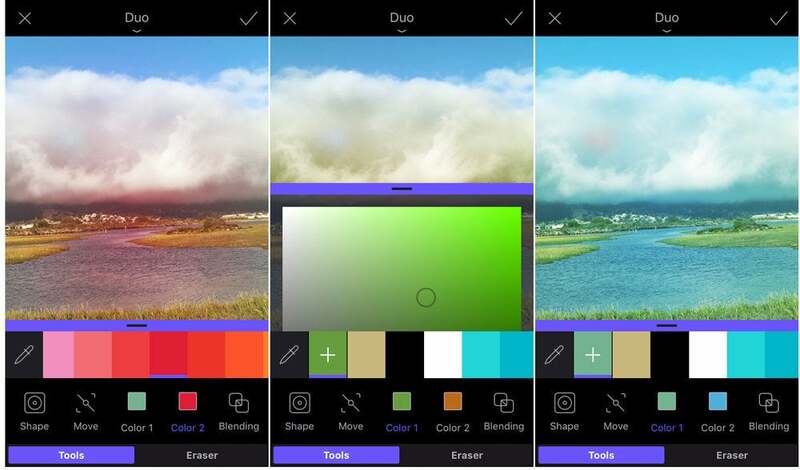 A new color dropper lets you reach into your photos to pick a color to use for special effects, vignettes, doodles, and other elements. Use the eyedropper tool to choose any color from your image. 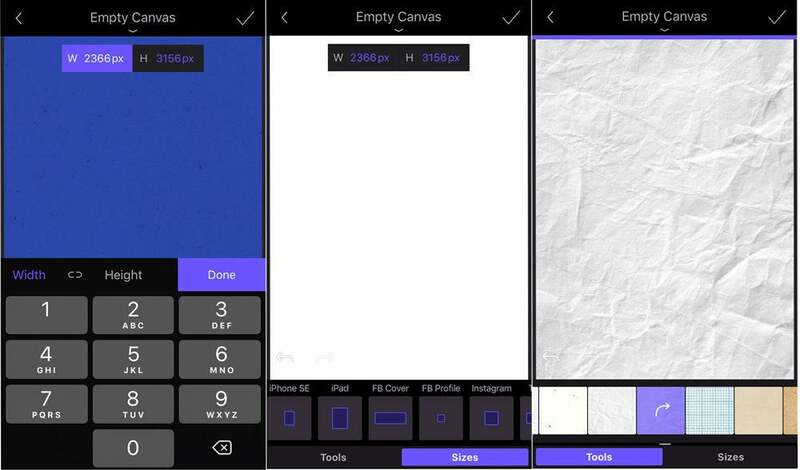 Start off with a blank canvas and add various paper textures or colors and employ specific templates for popular items like Facebook, Instagram, and Twitter cover images and profile portraits, or cards, posters, and other popular pixel sizes. A new Film module lets you choose among different film looks, while the Transform tool now works on layers. The app also supports transparency, unlike the original app. You can determine the exact size and background texture of your image. 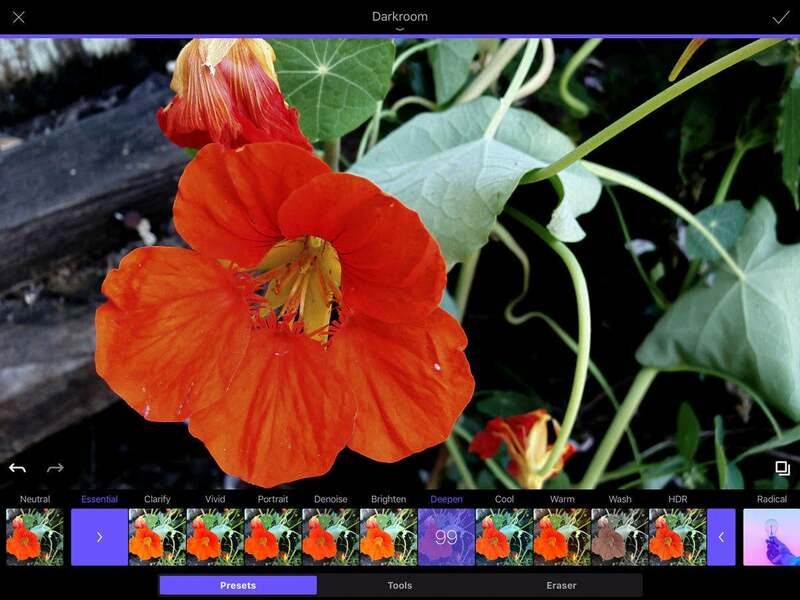 Photofox’s interface is streamlined, with well-defined, conventional ways to adjust edits and effects. Compared with Enlight 1, Photofox is less intuitive and harder to control, at least for new users. 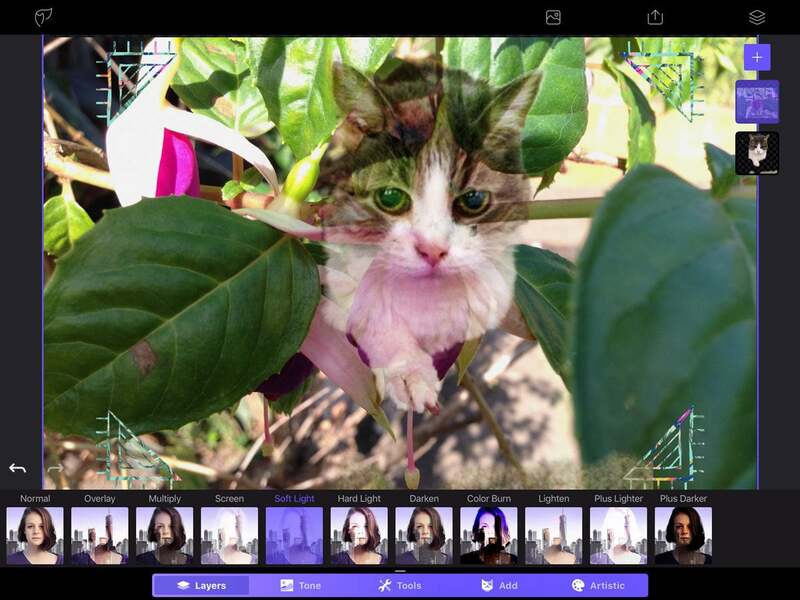 That’s partly because the app is more advanced, going beyond basic editing into the realm of compositing. While the app has built-in context sensitive instructional diagrams on how to use each feature, don’t expect to pump out expert composites immediately. It takes awhile to get comfortable with Photofox and to fashion a workflow that suits you, but once you do, it can become an obsession. There’s so much variety that you can go crazy with experimentation. Photofox’s subscription model introduces a pricing structure that determines which features you can use. The basic version is free. In addition to unlocking certain paid features, the subscription keeps you aligned with all the app’s new tools and updates over time. To use the Darkroom, Layers, and other assorted paid features, you must subscribe to Photofox Pro, which has three price points. One month costs $4; a 12-month annual subscription costs $20; and a perpetual license that includes unlimited use of all features costs $40. That means if you simply want to layer more than two images, you have three options to consider before you can proceed. Users who paid $4 for Enlight 1 already have a large percentage of Photofox features, though a few like Heal and Reshape are now behind the pay wall. To mitigate the financial hit, Enlight 1 users get three months of the pro version for free. Enlight Photofox offers a streamlined interface and a load of new, sophisticated features for free. It’s hard to argue with that, so I recommend that you download the app and try it out. If you already forked over $4 for Enlight 1, you may very well be set without investing any more money. Lightricks is still updating and improving Enlight 1 so you can even install and use both apps at the same time. Going full-on Photofox subscription mode is a decision based on how critical the app’s premium features and new content packs are for you. The good part is that you don’t have to decide right away.